In a June situation report on conditions in the South Maewo emergency shelters obtained by the Daily Post this week, an emergency medical team urges the early return of children to their home island of Ambae. Medical experts suggest that children in particular are suffering as a result of their dislocation from their home island. 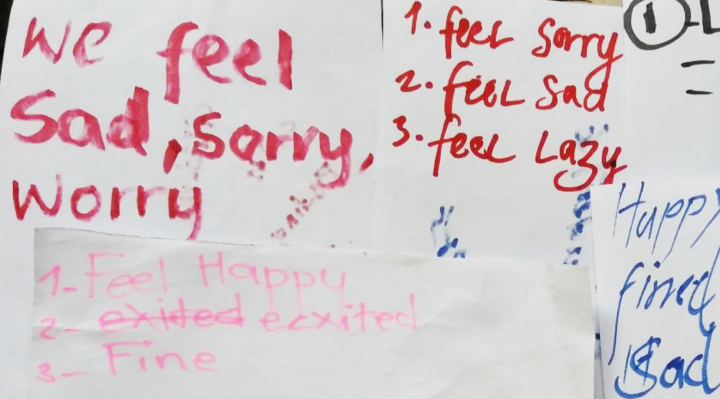 Asked by the assessment team to write about their emotional condition, many children wrote that they were ‘sad’, ‘sorry’, that they experienced ‘worry’, and that they were ‘lonely’ and ‘homesick’. A minority responded positively, using terms like ‘happy’, ‘excited’, and ‘fine’. Some of these positive responses appear to mask negative feelings though. One paper states that the child feels ‘Happy, fine, sad’. In their lists of the most positive aspects of the experience, children cited a nearby river, fresh fruit and produce, and the people of Maewo themselves. The picture that emerges from the report is of an under-resourced and overstretched support network trying, along with the displaced, to make the best of a critical situation. According to sources with knowledge of the situation, travel and transport capacity is unacceptably poor. Food, they say, is being provided by local and paid for out of the local school budget. Sources told the Daily Post that NDMO supplies were non-existent. Shelter, they added, was poor. Health care was being provided, however, and the local facility reportedly ran at about half its nominal capacity during the month of June. But the report repeatedly cites ‘urgent’ needs. Among the top priorities are computer equipment for record keeping, a refrigeration unit, and the machinery and the cash necessary to pay for travel in south Maewo. The team requests a small transport-capable truck, a 7-metre boat and engine, fuel and expenses for individual travel. The four-person emergency medical team, dubbed Charlie Team 1 in the report, spent several days evaluating the situation about two weeks after the first children arrived in South Maewo. Students and staff together number well over 150. Photographic evidence in the report suggests that children are sleeping on foam mattresses, either on cement floors or in tents. Asked for suggestions on how to improve, respondents listed numerous basic necessities, including water, toilets, shelter, classroom space, communications, and commodities such as stationery and toilet paper. But the report’s recommendations all centre around what has been described by experts as “clear signs of mental health detriment and deterioration from the experience”. Fears of direct damage due to eruption have subsided for much of the island, but concerns remain about the effect heavy ash fall might have on local streams and creeks, especially after heavy rain.